Saugatuck is a charming small town located in the Southwestern corner of Michigan. While we love Saugatuck any time of the year, we think it is especially beautiful in the autumn. From marveling at the awe-inspiring changing colors to touring quaint apple orchards and wineries, Saugatuck is the perfect fall getaway for families, friends, couples, or individuals looking for a break from the hectic pace of daily life. Get to Saugatuck before the temperatures drop for an unforgettable autumn adventure. And remember, the Twin Oaks Inn is a warm and welcoming homebase during your time in Allegan County. There is nothing quite like Michigan in the fall. From the cloudless blue skies to the brilliant red, orange, and gold leaves on the trees, Southwestern Michigan transforms into a beautiful riot of color from the months of September through November. One of the best ways to soak in these gorgeous fall colors is to visit one of Saugatuck’s many lovely parks. Take a pleasant, hilly hike to the beach at Saugatuck Dunes State Park or through the scenic dune trails at Oval Beach. For a shorter hike with equally beautiful views, try River Bluff Park, which promises to be exploding with color this time of year. Saugatuck is also a very popular biking destination. There are many great trails around the area where you can catch the breathtaking fall colors, including one that stretches from Saugatuck to Holland. The Saugatuck area is home to many one-of-a-kind fall festivals. The Saugatuck Ghoul Fest is the perfect way to get yourself in the holiday mood. With spooky bazaars, coffin races, live music, and themed kids activities, Ghoul Fest is as creepy as it is fun. Head to Fenn Valley Vineyard for the annual Music in the Vineyards Festival, where you can hear amazing jazz musicians play against the backdrop of gorgeous fall scenery. Fall also hosts a variety of art festivals and gallery events, including the Saugatuck-Douglas Gallery Stroll, the Blue Coast Artists’ Fall Tour, and the J. Petter Galleries Harvest Dinner. Fall is harvest season in Michigan. That means it is the perfect time to visit local orchards and wineries. Apple picking is the ultimate fall activity. 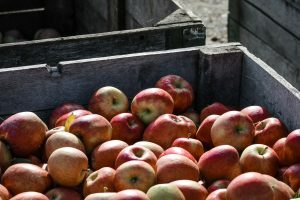 Several local farms, including Crane’s Orchards, feature U-Pick days where you can go out into the orchards yourself and pick your own apples. Throughout the fall, they also offer a massive 20-acre corn maze as well as cow and hay rides. If you’d rather skip the hard work and go straight to the drinking, visit Virtue Cider in Fennville, where you can tour their facilities, sip delicious cider in their tasting room, or purchase take-home ciders in their bottle shop. Wine drinkers should visit Fenn Valley Vineyards. During the fall months, you can watch the harvesting process take place as well as attend a variety of fun events, including their annual Vine Wine’d 5K Run. Did you miss some of these fun events and activities this year? No fear! It’s never too late to start planning next year’s autumn getaway. We’ll be back soon with our tips for winter fun in Western Michigan! 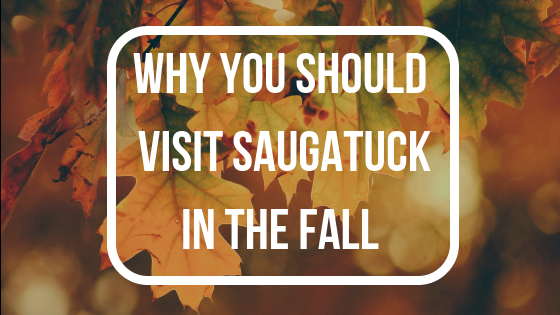 Planning an autumn adventure to Saugatuck, Michigan? Book a stay at the Twin Oaks Inn, a historic Victorian bed & breakfast located just one block from charming downtown Saugatuck.